Browse our quality cars and make a purchase today! Sell you car on consignment with our unique service! Enquire now and come visit us today!! 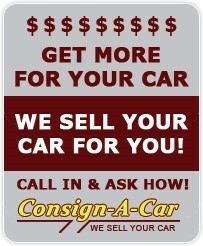 At Consign-A-Car we offer our clients a full range of services in order to make selling your car a simple process. Marketing your vehicle through our system will ensure you receive the best price possible for your car, while offering purchasers all the advantages of buying from a Licensed Motor Dealer. Consign-A-Car has been in business since 1999, a family run business that since its inception has grown in size and experience, now offering collectively over 100 years car industry knowledge and experience. Our dealership understands that the Used Car industry has had the best of both worlds for far too long, buying and trading cars for wholesale and selling for retail. Consign-A-Car are specialist consignment dealers and give private sellers the opportunity to sell their vehicles through us on consignment. We function under the same guidelines as any other dealer except we do not own the vehicles. Our Company is here to assist you to buy a vehicle from a private seller with the protection of purchasing through a licenced Motor Dealer. See our About Us and Services pages for more information.